NHL News : Tavares comments draw the ire of Islanders fans ahead of return to New York. Tavares comments draw the ire of Islanders fans ahead of return to New York. Tavares not winning any friends. Unless you have been living under a rock over the course of the past 9 months or so you have probably come to the realization by now that there is definitely a strong and very vocal segment of the New York Islanders fan base that is not all that happy with Toronto Maple Leafs star forward John Tavares. The former New York Islanders captain appears to have drawn the ire of at least some of the Islanders fans who did not much appreciate the way that he led the organization on for years and years. Tavares of course always said the right thing, indicated that he has no desire to play anywhere else other than New York, but in the end he did choose to walk away from the Islanders organization and instead opted to join his hometown team the Toronto Maple Leafs. 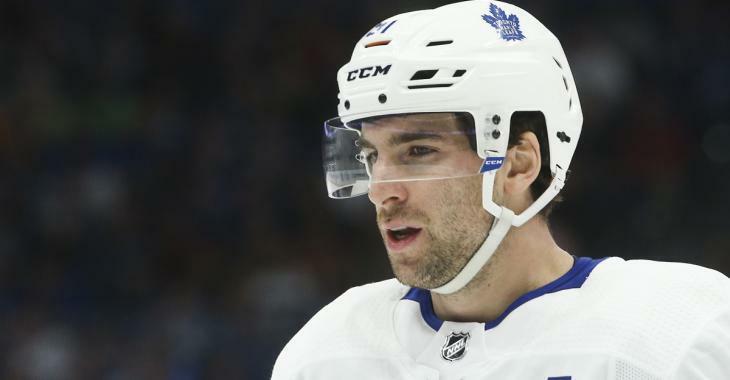 The move led to all kinds of abuse on social media with many fans referring to Tavares by the moniker of "snake," an ijnsult that has seemingly carried over for months now. It's very rare that you will see a story on Tavares that does not include at least a few angry Islanders fans in the comments, fans that are quick to cheer at his failures and lament his successes with the Maple Leafs. What is interesting however is that all the hate has seemingly had no impact on Tavares himself and you could even argue that he seems entirely oblivious to it all. In fact recent comments made by Tavares would appear to suggest that he really does not pay it any mind, as his latest comments are sure to once again draw the ire of the Islanders fan base. In a recent interview with Newsweek Tavares was asked about whether or not he had any regrets regarding his decision to sign in Toronto, and there was absolutely no doubt in his response. That will no doubt ruffle a few feathers and the timing could not be more perfect. Tavares and his Leafs are set to head into hostile territory at the end of the month when they will travel to New York to face the Islanders. In spite of his normally stoic exterior even Tavares admits that it will be a special game for him and for the fans. I for one can not wait to see what will go down between the Leafs and the Islanders, especially on the Islanders home ice. The fans will be hostile and the Leafs will be looking for revenge after losing 4 - 0 to the Islanders in Toronto earlier this season.